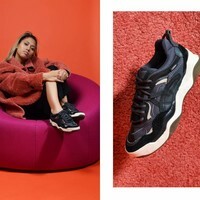 Vans their latest Varix Silhouette found it's inspiration in the tech skate silhouettes of the late ’90s and early 00’s. The Varix is the brand’s first ever lifestyle shoe built with Vans WaffleCup technology. We created a small colour popping editorial with Caroll-Lynn to show you the comFort of this sneaker. The Varix comes in the colourways True White Marshmallow, Multi Turtled and Black Ebony. The Vans Varix is available in store and online.